Tennis great and equality pioneer Billie Jean King keeps finding new ways to bring people together. Pioneer. Legend. Icon. Freedom fighter. That’s Billie Jean King. Since beating former Wimbledon men’s singles champ Bobby Riggs in a nationally televised Battle of the Sexes in 1973, King, the woman who helped usher in a new era of equality and empowerment, has added to her list of life’s achievements: winner of dozens of Grand Slam and Wimbledon tennis titles; recipient of the 2009 Presidential Medal of Freedom from President Barack Obama; defender of equal rights, in sports or otherwise, in matters of gender, race or sexual preference; cofounder of the groundbreaking coed professional tennis league known as World TeamTennis (WTT), which includes the Philadelphia Freedoms team, etc. During a recent visit to promote the upcoming WTT season in Philadelphia (July 10 to 25 at the Pavilion at Villanova University), which comes just two weeks after the 40th anniversary of Title IX, the irrepressible King sat down with South Jersey Magazine to discuss her remarkable career, her close friend Elton John’s best tennis shot, and why she once almost fainted on a special visit to Cherry Hill. 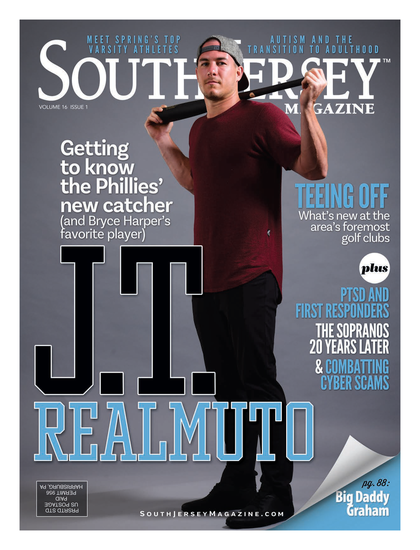 SOUTH JERSEY MAGAZINE: You’re famous for your intensity. Did you always possess it? BILLIE JEAN KING: My brother [former Major League Baseball pitcher Randy Moffitt] and I, we were just driven, both of us. We were very close growing up, and my dad was a total jock—very intense, a great teacher, a great coach, very good at fundamentals, very patient—so I was always learning from him. … My dad made me earn my first tennis racket; he wouldn’t just let me go play tennis. “Find a way to pay for it,” he said, so I went around the neighborhood and they gave me pseudo jobs so I could get my $8.29, and that’s how I got started. After I had my first coaching down at the public parks in Long Beach, Calif., where I grew up, at the end of that first day I knew I had found what I wanted to do with my life, and that was to be No. 1 in the world. I was 11 years old. Everything is intense if you’re any good, especially in sports—the concentration, the task at hand, the being in the now. I grew up in team sports as a child, and actually I prefer team sports: basketball, baseball, football, softball, running. Tennis can be a team sport, too. Tennis was my last sport and the only reason I got into it was because a friend asked me, and because I said, “What’s tennis?” Susan Williams, who lives in Philadelphia, and who still buys a box to the Freedoms—it’s all her fault I’m sitting with you today. You never know how another person is going to touch your life or you’re going to touch theirs. SJM: Sounds like your father was very influential in shaping your career. BJK: Fathers don’t understand how important they are to their daughters. My father was a huge influence on me; mothers are an influence, too, and I don’t ever want to discount my mother because she was [an influence], too. My brother and I have decided that my mother is the saint compared to my dad. My mother let my dad be the big shot in the family, but she was a jock, too, and she finally told me that about five years ago. She used to beat the boys in running, and she used to body surf 15-foot waves in Long Beach before we had the breakwater. She was the balance, the peacemaker and the more complex as far as how she would maneuver, which is very girly because that’s what we’re taught as girls. We have an antenna from the time we’re born how to bob and weave and make things work and make sure the other person comes first. We’re supposed to always be the support act, and that’s what culture has taught us till now. My dad treated me just like my brother: Dream your dream and just go for it. I loved him because of his intensity and his will to win. That got to the core of me, and he was a great father. He taught me some great lessons in life. I wasn’t allowed to read my [press] clippings when I was 15. I kept complaining that I never made the front page of the sports section of the Long Beach Press-Telegram. I finally made the front page when I lost [a match], and he said, “You can’t look at that anymore.” I asked why and he said, “Because it’s about yesterday, and it’s what you do today that matters, not yesterday.” And I never read my clippings again from that day forward. SJM: You were born in California and live in New York, yet you own the Philadelphia Freedoms. Why have your ties to this area remained so strong? BJK: I played for the Philadelphia Freedoms in ‘74, and I always wanted to own it. I love Philadelphia, I love the Freedoms, and I love the word “freedom” because it’s so powerful. In elementary school, I was fascinated with what it meant, and the cost of freedom. Elton John wrote “Philadelphia Freedom” for me. You could say it has been an important word in my life. When I played for the Freedoms, I had a lot of friends in Cherry Hill and South Jersey. In the 1970s we used to go over to Cherry Hill to see Aretha Franklin, and I about fainted when I met her. I love South Jersey. BJK: Elton used to come and sit on the bench and just watch us, and then we were going to a concert one day and he said, “I want to write a song for you.” I thought he was teasing when he first said it, because he teases a lot. Now the city has a great anthem. He’s just amazing to this day, the No. 1 guy. He’s so prolific. Every night for every show, with everything he does, he just wants to give the best show and wants everyone to be happy. We get along very well. BJK: His forehand is his best shot. He plays lots of tennis and takes a pro on the tour to hit with him in the morning. He’s always up early. He’s a maniac. SJM: What can people expect from a World TeamTennis event? BJK: If you see a World TeamTennis match, you see my philosophy on life. It’s men and women on the same team, the best players in the world. It’s equal contribution by both genders, so it’s on a level playing field. Everything we do is supposed to be equal. It’s like when the teams have only girl cheerleaders. It’s just the way I feel about it, but it’s eye candy for the guys. Why don’t the girls have eye candy? Everything should be co-ed. We’re kind of the innovative think tank in tennis, the ones that push regular tennis to change. We were the first to introduce music at all. We were the first to do a colored court with branding of the court. We’re the first ones to hit balls into the stands and you don’t have to give it back—just like a foul ball [in baseball]. We do names on the back of the shirts … because people don’t know all the players’ names. Keep it simple and help the fans out! SJM: You’ve left quite a legacy already, not just in tennis but in matters of equality and social justice. BJK: My epiphany was at 12 years old. I knew I was going to dedicate the rest of my life to equal rights and opportunities for boys and girls. I tended to help girls more because they’ve been underserved, but if you look at TeamTennis, you will see my philosophy on life. That way you never leave anyone behind. I’ve been left behind before, and I hated it. You don’t discount another human being by gender, by color, by sexual orientation—nothing. Just get in there and create opportunities for everybody. We’re all in this together, so let’s figure this out as a team.